Protecting Your Pets From The Holidays! Everyone loves the holidays, and our dogs and cats can’t help but get caught up in how excited we are. The good cheer, the holiday decorations and all the guests that will soon arrive are easy to get caught up in. That said, there is no reason this shouldn’t be a joyous season for pets as well. Honestly, as much as I thought I was prepared for having a dog during the holidays, Violet still experienced some of these below and lucky for me I was able to learn from my experiences but you should not have to. Perhaps the best gift you can give your family is to ensure you will have your beloved dog or cat well past the New Year! Avoid using tinsel on the Christmas tree or in other locations. Tinsel can cause intestinal obstructions in a dog or cat. Caution should also be used when placing garland in the home as a holiday decoration. Both these types of decorations are incredibly tempting, especially when they sway in the breeze. 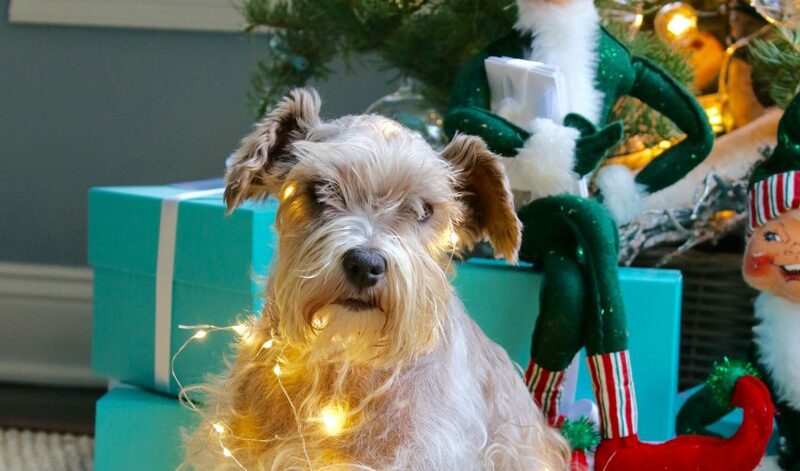 One year Corky, my former schnauzer, once ate her way around the bottom of the tree branches while I wasn’t looking. It wasn’t pretty afterward, believe me. Maybe she thought she was flossing her teeth? Mistletoe, holly berries, and some Christmas trees (cedar) can be toxic to dogs, cats, birds, and even children! And even non-toxic plants can cause quite an upset stomach if ingested by a dog or cat, so keep even “safe” plants well out of the reach of cats, dogs, and other pets all year round. The Christmas tree poses its very own danger. Cats may try to climb the Christmas tree, causing the tree to tip and fall, breaking glass ornaments and light bulbs in the process. Cat owners should either keep the tree in an area that is off-limits to the cat when a human is not present to supervise or consider tethering the tree using a bit of wire and some strategically placed eyehooks. For dog owners, you may find they like to hide out under the tree, so their constant in-and-out might cause the tree to shake and move, and if it’s not stable it could tip over. Tree fertilizer can leak into the water in the tree holder. This will make dogs and cats very ill if they decide it’s a good place to help their thirst. Similarly, adding anything to the water to extend the life of the tree (aspirin, for example) will also make this water off limits to animals. Best bet: get a tree skirt right away, or if that doesn’t deter your pet you might need to switch to an artificial tree instead. Pet owners should also avoid using glass ornaments on their Christmas trees, as this can pose a hazard to dogs, cats and humans if the glass ornaments are knocked off the tree and break. Violet can’t tear herself away from batting her little paws at the shine coming off the reflective surfaces. I’ve seen many excited dogs during the holiday season wipe off entire branches of decorations in a single excited tail-wag. If glass Christmas tree ornaments cannot be avoided, or have sentimental value, place the breakable ornaments on the higher tree limbs. Candles or the menorah can pose a danger to pets, especially if unattended. The cat may wander too close to the flame, resulting in burns. Or a playful dog may bump into a table and knock a candle over, starting a fire. Good bet: keep them up high. Better bet: Make the small investment in the battery-operated tea lights for use in all the lower decorations. You probably already know from experience that placing food down near pet-height can be too tempting for them. However, your guests may not be as aware, therefore be extra-vigilant. My recommendation: this is a fun job for the kids; all they have to be told is to keep an eye on the dog and make sure she doesn’t eat any of the guest’s food — the dog’s nose always knows! So, if a wrapped gift is placed under the Christmas tree, this provides the dog with an opportunity to “open” the holiday gift before December 25. Corky used to sniff out anything “yummy”-including fragrances and then chew on the boxes and the contents. Nothing was excluded from her investigating. (And you can imagine my embarrassment after so proudly wrapping a gift in my signature style to have to explain to the recipient why it looked so mangled.) She once managed to open a box of 48 individually wrapped chocolates and ate every one. The carefully opened wrappers were strewn around the tree. It must have taken her hours. Talk about inventive and persistent! So before placing a present under the Christmas tree, always ask the gift giver if the contents include a food item that may attract unwanted attention from the dog. Around Thanksgiving, Hanukkah and Christmas, well-intentioned owners feed their dogs fatty foods and even fat trimmings, which cause a potentially deadly inflammation of the pancreas. Even if you know to not do this, your guests may not be able to avoid the temptation of rewarding “those sad little eyes.” Also avoid feeding fatty food and large quantities of a new food, as this can cause diarrhea or vomiting in dogs and cats. And lastly, my personal plea: No pets as gifts! Please. The momentary joy your family or child will feel are insignificant compared to the risk the animal will linger in neglect and boredom. Pets are a tremendous addition to any household, and their health is as important as the other members of your household. Enjoy them and protect them! I hope this holiday season if fill with love, joy, and safety not just for you but for your four-legged pets as well. Happy holidays now mean to me “Happy Everything”, as we have so much more to be grateful for than just the holidays. “Our health”!